An ESO Workshop on Minor Bodies in the Outer Solar System (ESO MBOSS-98) was held at the ESO Headquarters in Garching, Germany, during November 2-5, 1998. Among these objects, the newly discovered Kuiper Belt Objects (KBO's) outside the orbit of planet Neptune (also known as Trans-Neptunian Objects) are of particular interest, but the meeting was also concerned with distant comets and some of the small moons of the outer planets. During these four days, about 50 specialists from all parts of the world, observers as well as theoreticians, had a very fruitful discussion about this rapidly expanding research field. In particular, they identified some of the crucial questions for which answers are required in order to advance our overall picture of the formation, evolution and interaction of these distant bodies. Specific plans were made for collaborative studies of the outer Solar System during the coming years. The workshop served to review and discuss current knowledge of all minor bodies beyond the asteroid belt, as well as their origins and inter-relationships. Special emphasis was placed on the optimal use of next-generation observational facilities, such as the ESO Very Large Telescope (VLT) at the Paranal Observatory (Chile) and the Keck telescope at Mauna Kea (Hawaii, USA). The participants enthusiastically identified several front-line observational investigations that will take full advantage of these powerful astronomical facilities. The Kuiper Belt is a zone outside the orbits of Neptune and Pluto in which icy solar system objects were expected to be present; the first was found in 1992. Since then, more than 70 KBO's have been found in orbits between approximately 30 AU and 50 AU from the Sun (4.5 to 7.5 · 10 9 km). One of them (designated 1996 TL66 ) even reaches a distance of 135 AU (20 · 10 9 km, i.e. 4.5 times the heliocentric distance of Neptune) when it is farthest away. It is estimated that there may be at least 100,000 KBO's larger than 100 km. These objects probably represent the remnants of a much larger population of such objects, formed in the early phase of the solar system, some 4.5 billion years ago. Gravitational effects from the outer planets Neptune and Uranus and collisions soon reduced their numbers. The outermost planet Pluto is most probably the largest member of this class of objects. Because of their large distance, and despite their significant size, 100 - 500 km diameter, they are all very faint and can only be observed with large telescopes. Except for their orbits, little is known about most of them, although recent observations have shown that they have different colours, ranging from rather blueish to red. According to current ideas, the short period comets observed in the inner solar system come from the Kuiper Belt and their kilometre-size "dirty snowball" nuclei are simply small KBO's. Among the highlights of this workshop was the presentation of a detailed portrait of a Kuiper-Belt Object, designated as 1996 TO66 . It was discovered in October 1996 by a group of astronomers from the University of Hawaii, during a survey aimed at discovering KBO's. It is one of the brightest trans-neptunian objects known to date; its magnitude is 21.2, i.e. it is about 1.5 million times fainter than the faintest stars visible by naked eye. A group of European astronomers  used the ESO 3.6-m New Technology Telescope (NTT) at the La Silla observatory during 6 nights in August and October 1997 to obtain very accurate observations of 1996 TO66 , while is was at a distance of about 45 AU. During these nights, they took over 50 images of the object through different optical filters; on each of these, they carefully measured its brightness. The resulting "light-curve", i.e. the change of brightness with time, shows a clear variation with a period of a little over 6 hours. This is caused by rotation of the object. It is the first time it has been possible to determine a rotation period of any KBO. From the mean brightness of 1996 TO66 , it was estimated that the diameter is of the order of 600 km. This corresponds to just under one third of the size of the outermost planet Pluto, making 1996 TO66 one of the largest known KBO's. The light-curve also indicates that the object is somewhat elongated (one axis is at least 10% larger than the others), and that the surface may possibly have some darker and brighter regions. This first measurement of the rotation period of a KBO is important: as 1996 TO66 is a comparatively large body, it is most likely that the rotation period has not changed much since its formation, 4.5 billion years ago. This is one more precious piece of information to our still very sparse knowledge about the processes that took place when our solar system was formed. Interestingly, (2060) Chiron , a minor planet in orbit between Saturn and Uranus that is thought to have originally come from the Kuiper Belt, also rotates with a period near 6 hours. A comparison of 1996 TO66 's brightness as measured through different optical filters, indicates that it is of a grey-blue colour, similar to that of Pluto's moon, Charon , and also the KBO 1996 TL66 . Very little is still known about the physical nature of the KBO's. They are so remote and faint that their study, even with large telescopes, is near the observational limits of what is possible. Nevertheless, new results like these now pave the way towards a better understanding of the current population of minor bodies in the outer reaches of our solar system. When more observations of KBO's with large telescopes like the VLT become available during the next years, it is expected that trends in their measured physical properties (e.g. rotational state, surface properties) will emerge. This will in turn permit more specific conclusions about the structure of the proto-planetary disk and the processes by which the planets and the KBO's were formed. ESO Video News Reel 2 was published on November 18, 1998. 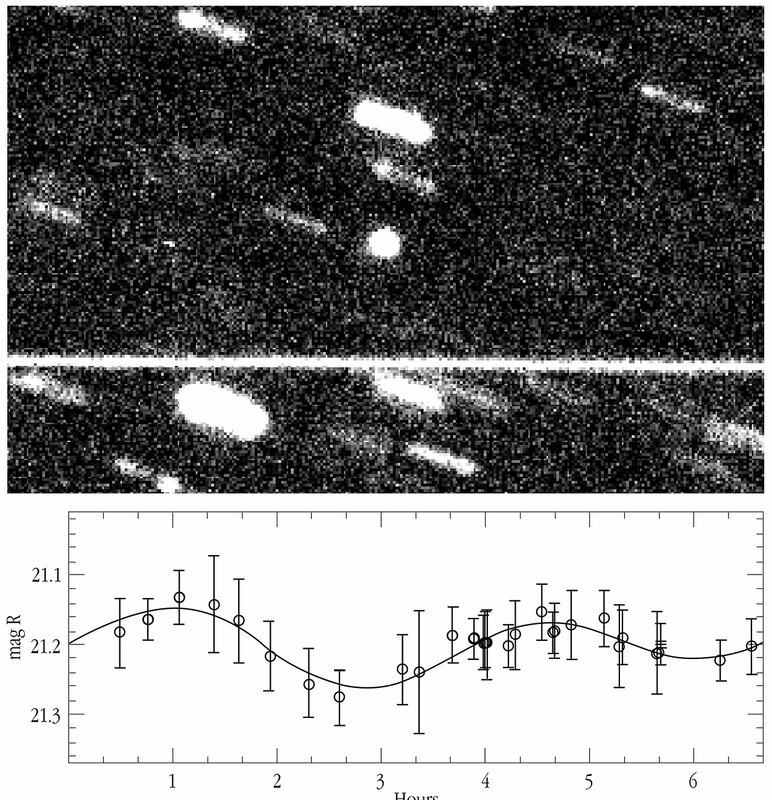 It contains video material related to the new observations of Trans-Neptunian Object "1996 TO" described above. In addition to sequences from the La Silla observatory and the NTT, there is a comprehensive statement by one of the participating ESO scientists. The group consists of Olivier Hainaut, Catherine Delahodde and Hermann Boehnhardt (ESO La Silla) and Elisabetta Dotto and Maria Antonietta Barucci (Observatoire de Paris).